Definition at line 75 of file llviewquery.h. Definition at line 80 of file llviewquery.h. Definition at line 79 of file llviewquery.h. Definition at line 78 of file llviewquery.h. Definition at line 61 of file llviewquery.cpp. Definition at line 83 of file llviewquery.h. Definition at line 67 of file llviewquery.cpp. Definition at line 65 of file llviewquery.cpp. Definition at line 111 of file llviewquery.cpp. Definition at line 71 of file llviewquery.cpp. Definition at line 69 of file llviewquery.cpp. Referenced by LLView::getFocusRootsQuery(), and LLView::getTabOrderQuery(). Definition at line 74 of file llviewquery.cpp. 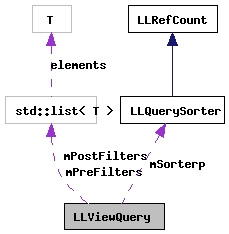 Definition at line 95 of file llviewquery.h. Definition at line 76 of file llviewquery.cpp. References filterChildren(), mPostFilters, mPreFilters, and runFilters(). Referenced by LLView::focusFirstItem(), LLView::focusLastItem(), LLView::focusNextRoot(), LLView::focusPrevRoot(), and operator()(). Definition at line 124 of file llviewquery.cpp. Definition at line 73 of file llviewquery.cpp. Referenced by LLUICtrl::focusFirstItem(), and LLCtrlQuery::LLCtrlQuery(). Definition at line 102 of file llviewquery.h. Referenced by addPostFilter(), getPostFilters(), and run(). Definition at line 101 of file llviewquery.h. Referenced by addPreFilter(), getPreFilters(), and run(). Definition at line 103 of file llviewquery.h. Referenced by getSorter(), and setSorter().